Do you dread sitting in boring meetings? Let’s change the way we all work by holding better meetings. 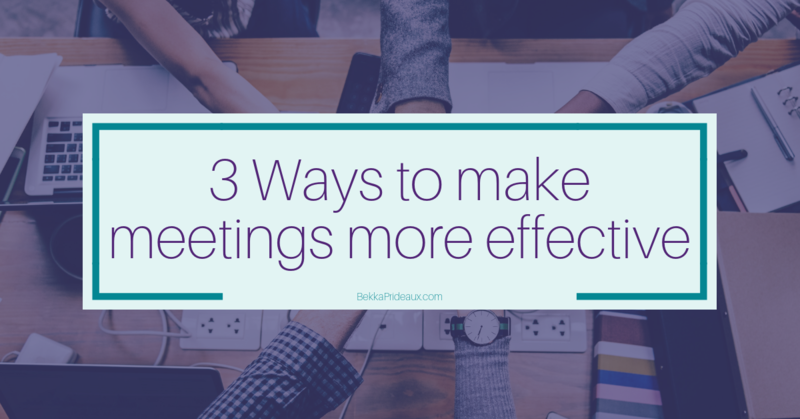 Here are three top tips for engaging and effective meetings which people will want to attend. A couple of years ago I read a BBC article on How to look interested in boring meetings and it has stuck with me because I found its premise so frustrating. I have sat through my fair share of meetings so dull they would make watching paint dry look fun and a guide to surviving certainly has its place but – and this is a big but – surely the solution is not to fake interest but to ensure meetings are not boring in the first place. If we mask our true feelings, then how will meetings ever improve? As the leadership element of our working lives grows so, typically, does the amount of time we spend in meetings. Therefore getting them working well for us can have a huge impact. Imagine how much better your working day would be if all meetings were engaging, and productive, genuinely helpful and interesting? Stephen Covey, author of The 7 Habits of Highly Successful People®, talks about “always beginning with the end in mind” – and this also important advice for effective meetings. Meetings are time and resource-hungry and knowing their purpose is fundamental to making them productive and engaging, and to ensuring they have a positive impact on both the business and the individuals attending. What do we want to talk about which has not already been discussed? What do we need to work out? What do we need to decide? What are the outputs for the meeting? What questions do you want to be able to answer for people as a result of the meeting? Is a meeting the best way to accomplish this? Your answers will provide the foundations for a productive, engaging and effective meeting, and the remaining two tips assume you have already answered these questions. Summarising the purpose and desired outputs of the meeting will give you the basis for a focused and productive agenda. It will allow you to remove items which are not relevant to the purpose and which will not help you towards the outputs. You will know which agenda items could be managed outside the meeting or covered in a separate, more relevant meeting if necessary. Sharing the meeting purpose and desired outputs with your published agenda will give attendees time to prepare and allow them to arrive ready to contribute in the best way. They will have had a chance to gather any information you are expecting them to contribute, to consider their positions and to understand what they will gain from the meeting. It will also give you chance to circulate any necessary pre-reading, again cutting down time spent in the meeting itself. This simple practice will allow everyone to arrive with the same expectations, energised and ready to make it a great meeting. Having established your purpose and outputs, it should be easy to invite only those who are actually needed to achieve the meeting aims. If certain people are required for just one of the agenda items, then only invite them for that section of the meeting or split your meeting into a series of smaller ones. By its very definition, time is a limited resource, so why not let everyone make the most of theirs and avoid having them sit through sessions which are irrelevant to them and therefore just not interesting. If someone needs to understand what was discussed – or just know the decision you have made – simply share the output, rather than have them in the meeting itself. On the surface, these three tips may just look like extra work for the organiser but, in my experience, I have found that a little preparation upfront reaps huge rewards, resulting in more productive effective meetings and more engaged attendees. Think of the most engaging meetings you have held or attending. How much better would life be if all meetings could be like that? My challenge to you is to try my tips with some of your meetings and experience the benefits for yourself.